I have come across so many great pieces of melted crayon art lately. I have been dying to try it out and since it's fall we decided to make some fall trees with them. We started out by tearing out a trunk from a piece of brown cardstock. I let Maisy do her own and it looks like it's swaying in the wind. She glued it onto a piece of cardboard. Then I had her pick out some crayon colors that she thought she might see in the fall. She had to get the crayons into just the right position - she didn't suspect what we were about to do next to them. We turned on the blow dryer and pretty soon the crayons began to melt. It was fun to see the colors swirls around with the wind from the dryer. Mina then decided she wanted to come out and join in our fun. She was anxious so I tore out the trunk and glued it onto her cardboard for her so she could get to the "fun" part. She had no real system in putting her crayons on the board - she just threw them on. It was perfect, she held the blow dryer herself most of the time and her colors soon began to melt and swirl around each other. At first Maisy wanted to put her picture in the sun to "dry". I had to explain to her how the pictures needed to be in the shade to cool and dry - opposite of how you would dry a painting quickly. Once the melty crayons had started to harden they wanted to poke their fingers in it a bit. The girls really enjoyed creating their trees and they especially loved the smooth yet bumpy textures. It was slightly squishy, just enough to leave little fingerprints - maybe we could make some fun handprints in the future? After observing how the crayons melted when heated and hardened once they began to cool, Maisy wanted to see what some of the melted pieces would do if she put them in water. She was sure something would happen if she just kept stirring. The finished pieces - Maisy really wanted to make another one so we will probably do another melty crayon project soon. 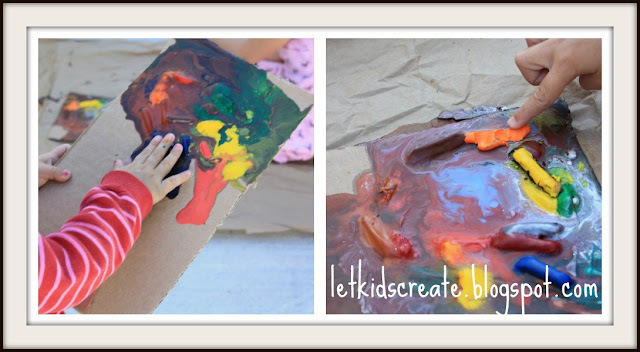 I love the texture the melted crayons creates! Needless to say, this is now our crayon melting blow dryer. I'm glad I decided to pull out one I wasn't using anymore! The trees turned out so awesome! 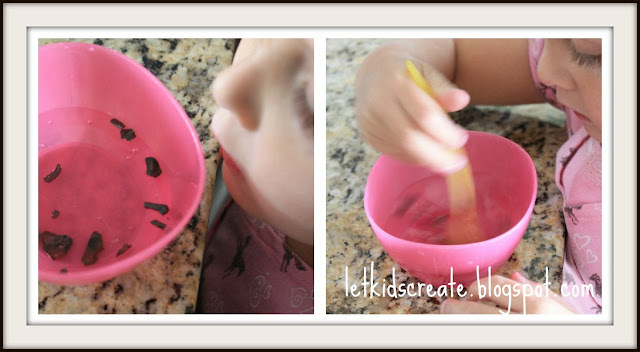 My kids would absolutely LOVE doing this and it's such a perfect fall activity! Plus, I have a huge batch of broken crayons I've been saving for something. Thanks for the great idea! This is SO neat! I too have seen many melted crayon crafts, but this one it totally unique! :) Very cool! thanks for popping by My Own Four Corners, I am your newest GFC follower and am loving your site, finding SO many inspiring crafty ideas! 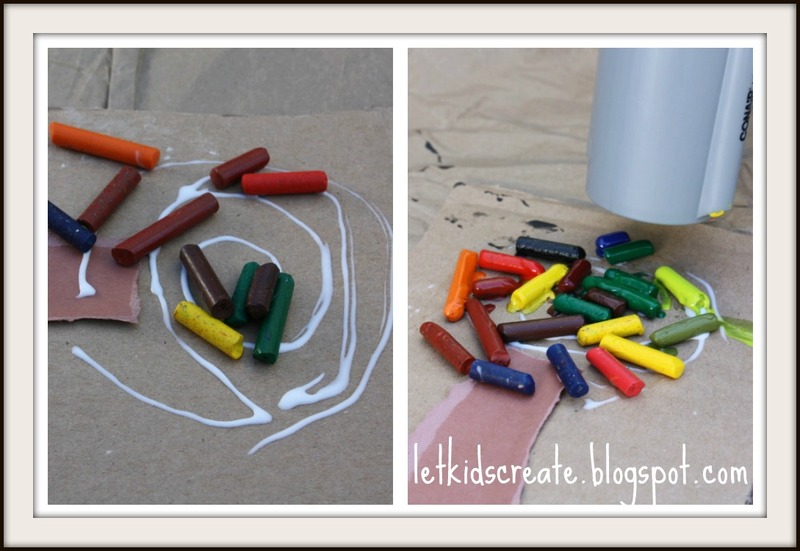 This is such a neat twist on the melted crayon idea, love it. I would love for you to link this up to the AfterSchool linky party. the trees turned out beautifully. 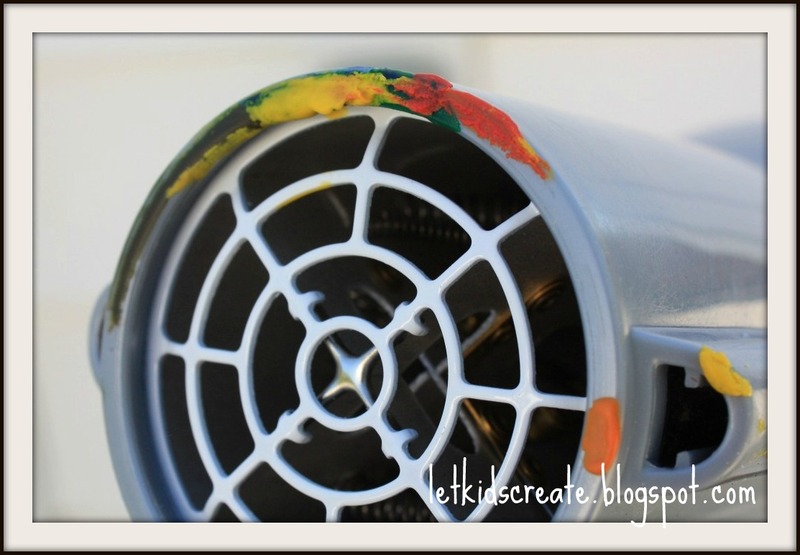 What a great idea - I've been meaning to do some melted crayons from our bits and pieces for gifts but love the idea of turning some into some art work as well. Oooh, what lovely texture! I can just imagine how nice it must have felt for them rubbing their fingers over the bumps. This looks like fun! We have our own twist on the melted crayons too! I love how excited the little ones get when the crayon starts to melt!!!! We actually used the blow dryer today with regular paint on cardstock that we drew leaves on! We are loving the blow dryer as a paint brush! oh, this is awesome - sorry about your blow dryer but glad it wasn't your everyday one! 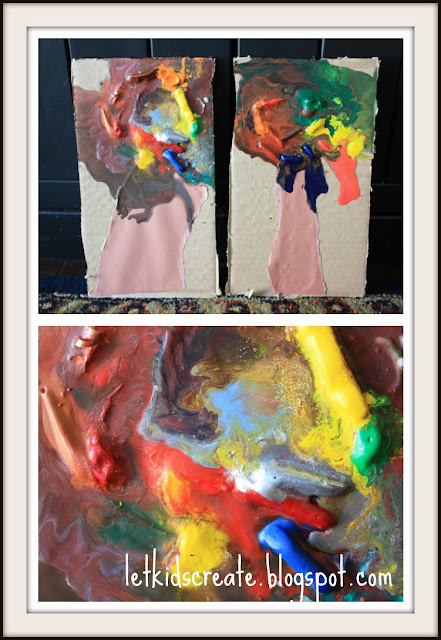 I just saw this on Pinterest, what a great take on the melted crayon art. We are going to have to try this. Wow! That looks SO fun! They turned out great! Thanks for linking at One Artsy Mama. I adore these, especially how the crayons melted together, creates so much movement! Awesome awesome! Thanks for linking up to Flutter By Friday, hope you come and share with us again this week!